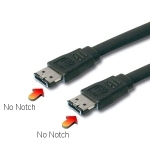 These shielded cables are used where both the external SATA device and the SATA backplate (or external port) are fitted with I type eSATA connectors. These eSATA 150/300 cables (also known as SATA 2 or SATA/300) support data transfer speeds of up to 3 Gbits/s. Metal latches on the connectors ensure secure contact to both PC and device.